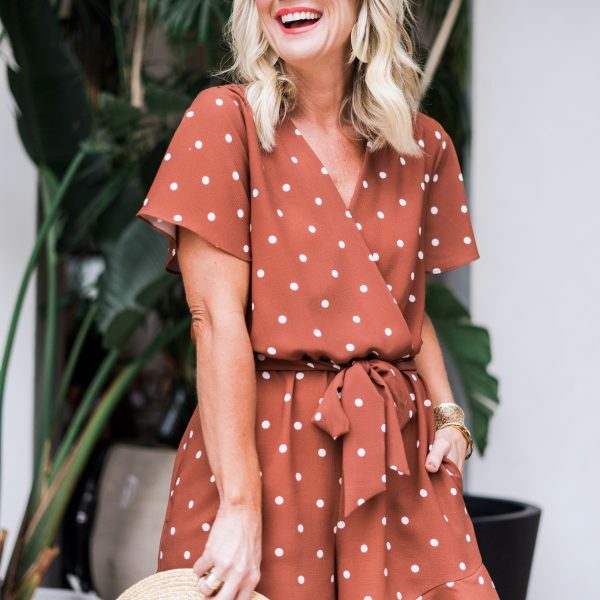 Day to Night | Halter Dress | hi Sugarplum! Monday, Monday! Always rolling around way too quickly! 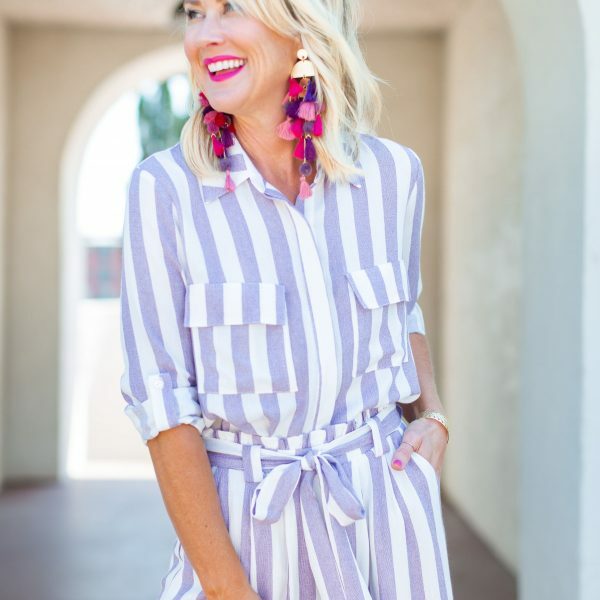 Although, I’m super excited about this week…I’ve got so much Spring style inspiration for you, plus it’s Little Miss’s 13th birthday! I’m surprising her with a weekend trip to NYC…and Mama Sugarplum is coming, too! We’re picking her up Friday at school and heading straight to the airport. We’ve got show tickets, a food tour, frozen hot chocolate, and ferry rides on the agenda, but I’d love to hear any suggestions you might have, too. We’ve been to New York several times (see all our recaps linked at the bottom of this post), but this is her first visit, and I really want to make the trip, and her birthday, special. 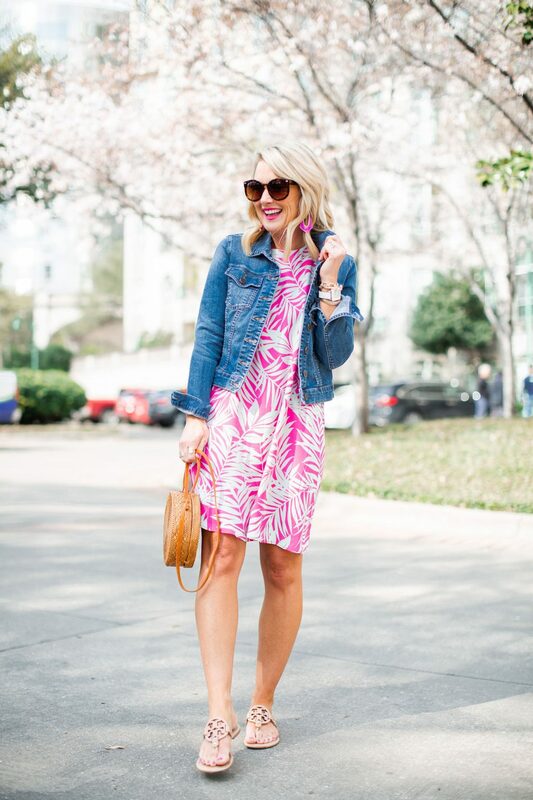 I haven’t checked the weather yet, but hoping we get a little Spring while we’re there…and I know just the dress to pack! 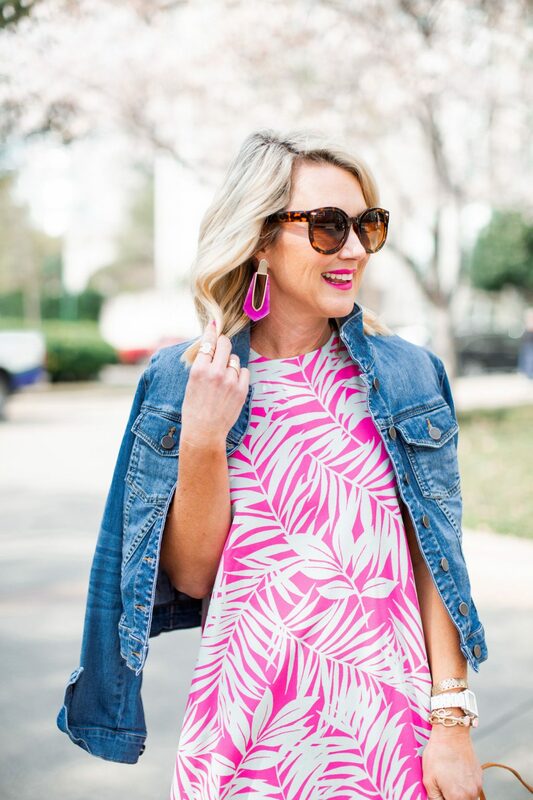 To show you just how versatile it is, today I’m styling it for Day & Night, and jazzing it up with pieces from Kendra Scott’s new Spring Collection (see the end of this post for an exclusive discount)! 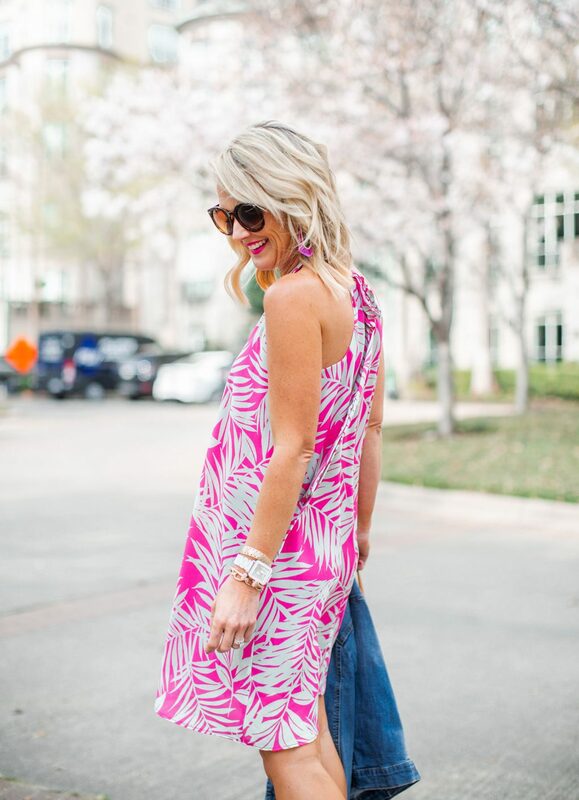 This pink fern pattern was a reader-favorite in the Palm Spring Maxi Dress, and I absolutely adore it in this shorter halter dress! 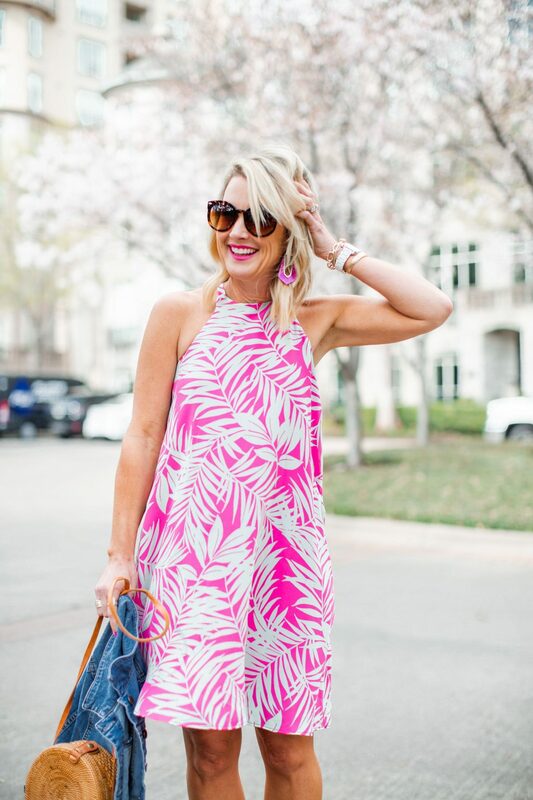 The color is so bright and flattering, and the print perfect for Spring and Summer (and especially vacations!). The tie gives it an adjustable fit, and the swing shape is so forgiving. For casual wear, I pair it with these flat sandals or wedges like these or these. Fit Tip: I’m wearing a regular XS. I pair it with this stick-on Nubra, or this strapless bra. Now let’s talk accessories! Kendra Scott hit another homerun with her latest Spring Collection, with so many new and unexpected pieces. I love all the new shapes and colors she’s been creating lately, but each with the same quality of design and stones we’ve come to love about the brand. This lightweight filigree cuff is a new addition to my bracelet stack, and I love the texture and versatility. I’d wear this combo for everything from church and brunch to shopping and bridal showers…it honestly works for so many occasions. And you can’t beat the price! But what about date night, weddings, and other evening events? Easy! Just swap the sandals for heels, and bold accessories, and you’re ready to hit the town. A little pop of leopard is always a good idea, too! 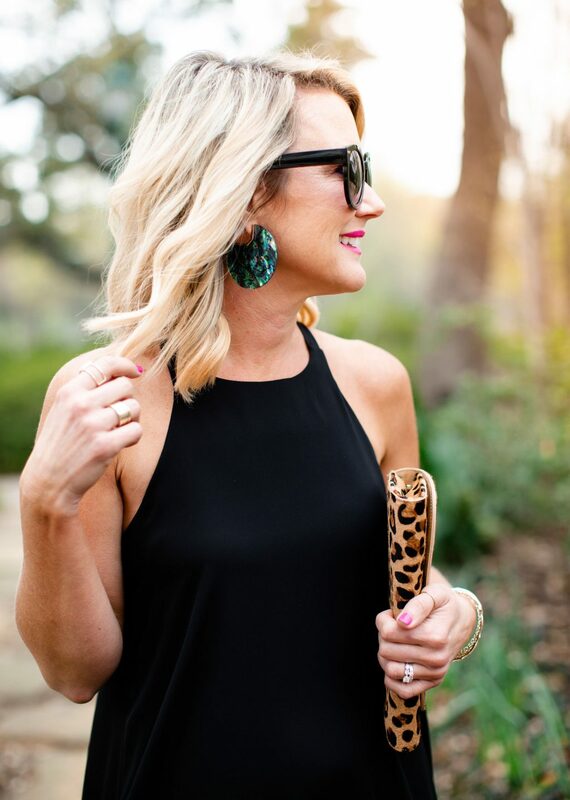 This LBD is season-less and perfect for virtually every occasion! The halter neckline is so flattering on this dress, but the back is the real showstopper. Perfect with an up-do, too. 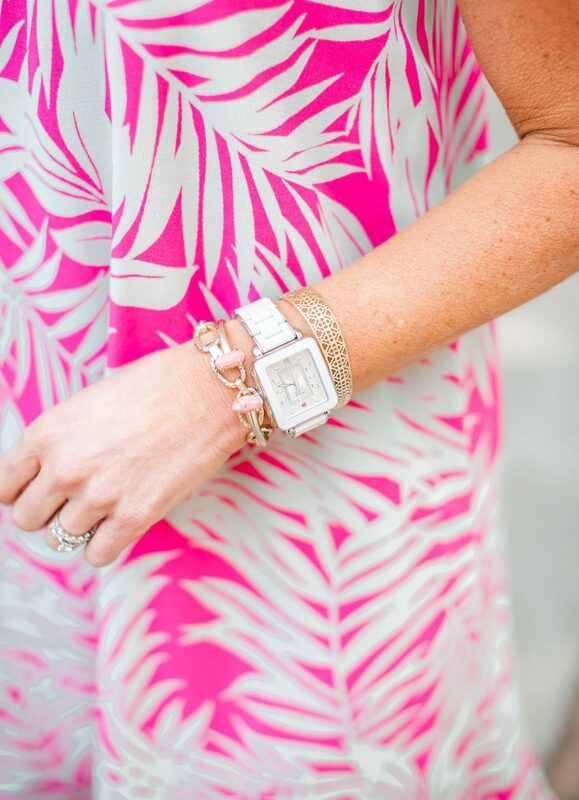 If you only buy one piece of statement jewelry, let it be this cuff! I instantly dresses up any combo, is so lightweight, and goes with everything! I wear it all.the.time. The Kai Hoops in ‘abalone shell’ are new to the Spring Collection, and absolutely stunning! Shades of blue, green and black make them incredibly versatile, and such a gorgeous statement for evening. 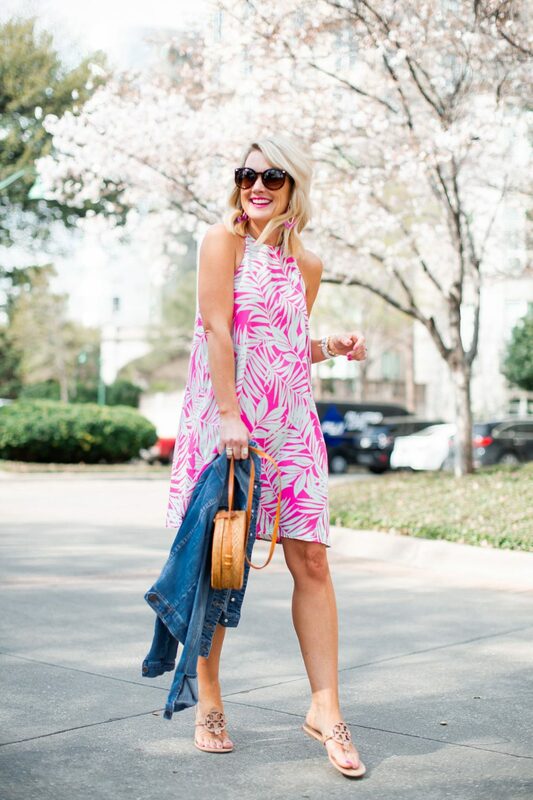 This flattering, easy-to-wear swing dress is perfect for all your Spring and Summer parties and more…the problem is choosing a color or pattern! Which is your fave? Did you notice all the Sugarplum Faves in this post? 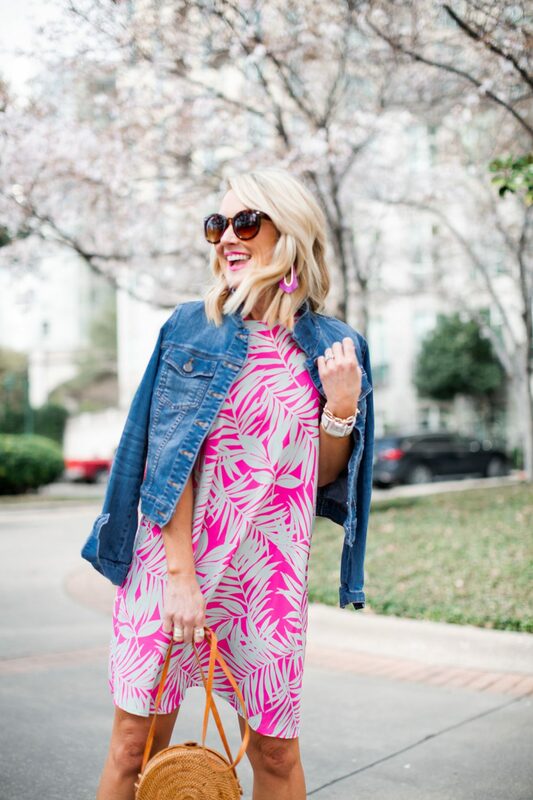 The ring trio, bargain sunglasses, and perfect pink nail polish are all part of my Sugarplum Top Five found here and here, and truly my go-tos! And I’m so excited to share an exclusive discount for Hi Sugarplum readers!! Save 20% off every $100 purchase at Kendra Scott with code HiSugarplum. Surprise! The Rest of the Resort Collection is Fully Restocked!! Resort Collection Restock is Here + New Colors & Patterns! 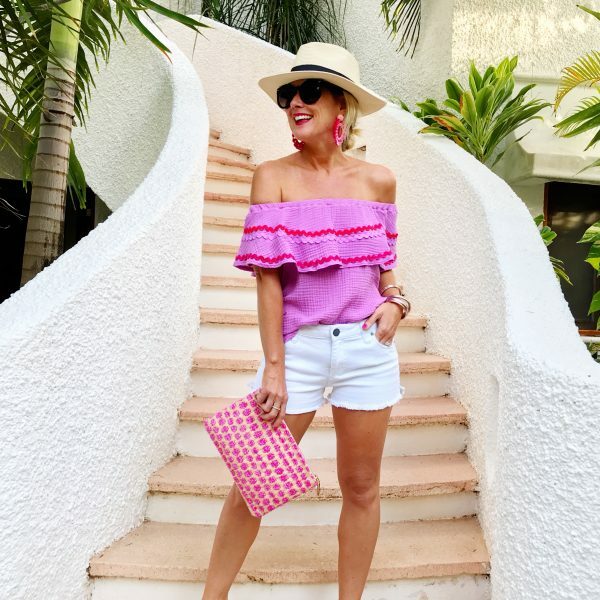 Snapshots from Mexico | What I Packed & Wore! Such a cute dress! I’d love to see a midi length (40” or so) in a collection some time though. This one would be way to short on me. You look great though!!! Something tells me ya’ll best be taking some polar fleece to NYC, ha,ha. Maybe a hat/gloves too. That swing dress turned black says Supa-Classy! Wow these dresses are truly beautiful. Would it be possible to make the dresses a bit longer. Dresses above the knee are not flattering on me and I suspect many others. There are the maxi dresses but those are often too long for day to day wear. Even just 4 inches longer would be helpful on the shorter dresses. I know that this is not considered fashionable on the contemporary scene but my conservative environment requires just a bit more coverage. I am certain the plus size readers may also want a longer length. Thanks for your work on these items. It is as if we have our own designer who can provide items we really can wear. What a wonderful present!! I took my (much) younger sister for her 16th birthday to NYC, and it was so much fun! She had never been to a BIG city, and it was really need to just watch her world get bigger. Check out free tours by foot! All of the tours are free – you just tip your guide. I’ve taken 4-5 of them over the years, but we did a really fun one of the West Village. Also, I highly recommend Chelsea Market (get a Nutella crepe!) and walking on the High Line – especially if the weather is nice. I hope you all have so much fun! You had me at Nutella crepe!! A fave of Little Miss, too! Thanks for the fun ideas! Happy 13th Birthday to Little Miss–the cutest sweetest teenager! I can just imagine her joyful squeal when she finds out about the spectacular surprise weekend you and Mama Sugarplum have planned! Thank you so much, friend! I’m so excited to spend the time alone with her and Mama SP! Hi Cassie, I always recommend the Tenement Museum Tours to people and anyone I have recommended them to, loved them as much as I do! They are only about 90 minutes, there are (I think) 3, but you can just pick one of them (I have done all 3 and they are all good)…it sounds like an odd thing to recommend on a “fun trip” but truly, they are so fascinating and you will walk away with a true respect and understanding of what life was like back in the early 1900’s for immigrants. Some friends have taken their children and they loved it. Have a great trip! IF you are doing the FOODS OF NY tours, you will not be disappointed, they are awesome and the guides are hysterical. That tour sounds so interesting! And yes, we love Foods of NY tours…I’ve done 4-5 of them!! 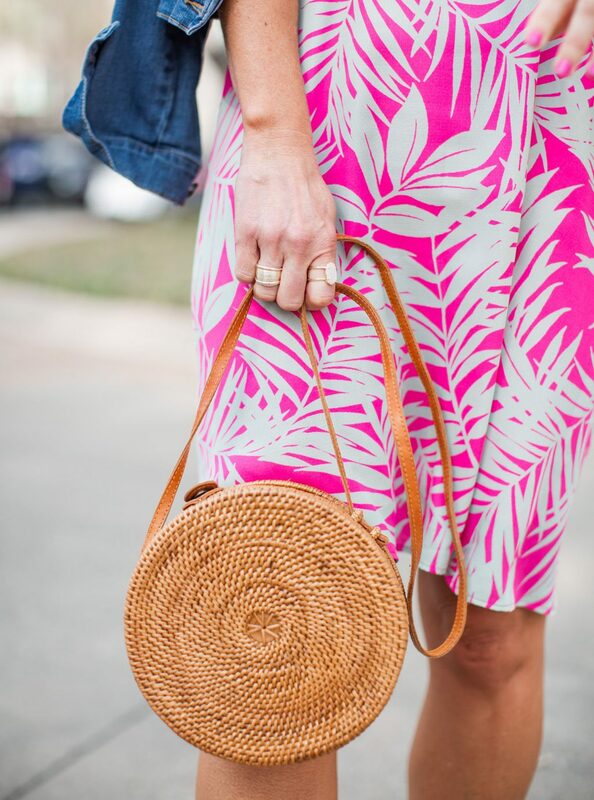 I have the same little round woven bag. I bought it last month when we were in Bali. Nice to see you love it as well! Cute dress, however you will freeze in NYC wearing that! It’s still chilly. Happy Birthday to your sweet daughter, it’s a memorable gift you are giving her. What a fun idea for a 13th b’day! Have you ever tried Pinky’s for a pedicure? Favorite place in the world to get my toes done! It’s a must-stop every time I go to NYC. My best friend used to live on the Upper West Side and she introduced me to it. We’d grab Starbucks and head to their cushy velvet chairs to get pampered. Also Rosa Mexicana is a fun atmosphere with ah-mazing guacomole they make table-side – and it’s right by the Lincoln center. Make a reservation though! The frozen hot chocolate at Serendipity is sooo good! Finally if you’re looking for a good brunch place Sarabeth’s is phenomenal. My husband and I went there a couple years ago and we still talk about the French toast! Have the most wonderful time! I ❤️ NYC! Oh my goodness – I’m doing the exact same thing with my daughter for her 13th birthday in 2 weeks! It’s her first trip, too, so we are doing all of the major tourist stops, plus some simple mom and daughter chill time. I look forward to following your adventures, AND your outfits. Like you, I’m from Dallas, so I’m struggling with the weather difference. I mean, darn – how I’d love to wear that cute halter dress!! Have a great time!! !